Here's another alternative for an algebra 1 course for homeschooled students: Algebra 1 by Paul Foerster (the textbook), and accompanying Home Study Companion video lessons made by David Chandler. I've just written an in-depth review of both. In Virtual HS, the ratio of the number of juniors to seniors is 7:5. The ratio of (the number of) junior males to junior females is 3:2. The ratio of senior males to senior females is 4:3. What is the ratio of junior males to senior females? He asked if it can be solved using "Singapore" style bar model. I'm not sure if this is exactly how they'd do it, but this is how I'd do it... so here goes. After I made the diagrams, I soon saw that Dave's numbers are two awkward; the bar diagram drawing would get too messy because we'd need to divide it into too tiny parts to see anything. For those of you who're waiting... LightBlue 4th grade is just days from being finished. Right now I'm putting finishing touches on the lists of web resources I've added to each chapter. Just about everything else is ready. I felt like giving away something again to help all of you who need math lessons... This one is taken from Math Mammoth Division 2 book and is a lesson on the concept of average... meant for initial teaching for 4th-5th graders who have mastered long division. The lesson mainly uses word problems, BTW. Please post your comments below; I'm anxious to hear them! There's lots to read and enjoy at the newest carnival of homeschooling. I enjoyed the old schoolhouse photos as well! I know my dad attended a fairly small village school; maybe it was similar to these schoolhouses. Griddlers make great “paint by number” puzzles for kids of all ages - Sol from Wild About Math shares some great number puzzles where you color in a picture based on number clues. I just wanted to share a little "game" that helped my 3-year old preschooler to recognize her numbers. It's SO simple! Basically you just pick numbers, calling out their names, and taking turns. Pi is a ratio, yet irrational? We know Pi is an irrational number; mathematicians have proven it to be so. But its definition says that it is a RATIO of the circumference and the diameter of any circle. Now, when you divide a rational number by another rational number, you get a rational number. Doesn't this seem like a contradiction? In the equation where the circumference is divided by the diameter, when the circumference and diameter are rational values, why is it that the quotient can be an irrational quantity? Pi = C/d, where C is the circumference and d is the diameter of some circle. It follows that either C or d or both have to be irrational! I got word about this nice math event. 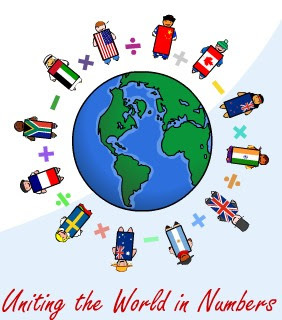 In World Math Day Challenge (held on March 5), students from across the globe will be uniting online to play each other in real time mental arithmetic games. These are tailored to the students' levels so students of various ages can participate. They are expecting more than 1 million students from over 100 countries! It is one of the world's largest participation events. World Math Day is free of charge for both schools and students. All you need is Internet access. And, there are even prizes! More information may be found at www.WorldMathDay.com. This is a nice opportunity to do something fun with math, and at the same time connect with other kids, even across the globe, without leaving your home. You can register already; the event is on March 5. I failed to publish this the other day since Blogger was acting up. I'll try it now. A rectangular kitchen table is three times as long as it is wide. If it were 3 m shorter and 3 m wider it would be a square. What are the dimensions of the rectangular table? The dimensions are 3 and 9. But since this is supposed to be a 6th grade problem, surely we can find another way to solve it, as well. 2) Think of the two quantities length and width as just numbers. If you reduce one by 3, and increase the other by 3, they will "meet" or be the same. Below, I've drawn the two numbers as lines; you could use bars. I'll let you try it first, but don't post the solution as a comment into this post. Let others try solve it too. I got word that folks at Blogged.com had rated a bunch of math blogs, and placed mine in the top ten, with rating 8.6 (out of 10). They evaluate blogs based on the following criteria: Frequency of Updates, Relevance of Content, Site Design, and Writing Style. So here is a list of mathematics blogs, rated in a scale 0-10. The list does resemble the blogrolls that I've seen on other math blogs... If you're a math blogger, go find yours!